To the bowl of stand mixer fitted with the paddle attachment, combine butter and salt and beat for 1 minute on medium-high speed. Add 3 1/4 cups confectioners’ sugar, milk, peppermint, and beat on medium-low speed until a dough forms. If the dough seems wet, add additional confectioners’ sugar until dough combines (I use 3 1/2 cups sugar). The dough will be crumbly but will come together when pinched and squeezed into a ball. Taste the batter. If you want a more intense mint flavor, add additional mint extract, to taste. * Be very careful how much mint you add; you cannot un-do this. I repeat, be very, very careful with how much you add. Even 1/8th teaspoon peppermint extract can change flavors, dramatically. Remove dough from the mixer, separate it into 1 to 4 smaller balls, and add one ball back into the mixer. Add the food coloring of your choice to the ball by squirting the droplets on top of the dough (careful when you turn on the mixer), and paddle on low speed until coloring is well-blended. Coloring will not blend completely into each and every speck of dough if examined extremely closely, but overall, mix until color is uniform. (I separated approximately two-thirds of the dough and made it green using about 15 drops green food coloring and made one-third of the dough red-pink by using about 7 drops red food coloring). Place a golf-ball sized amount of dough in your hands and roll dough into long thin cylinders about 1 centimeter wide. Place cylinders on countertop and with a pizza cutter (or knife – be careful of your counter), slice cylinders into bite-sized pieces, approximately 1 centimeter long. 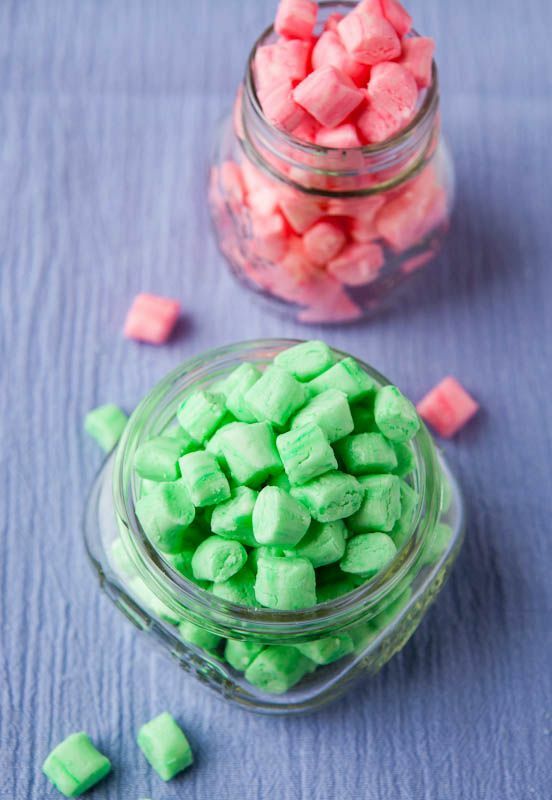 Store mints in an airtight container in the refrigerator where they will keep for many weeks.